The Supreme Court Bar Association (SCBA) on Tuesday celebrated the launch of its journal SCBA Times at the Supreme Court lawns. The occasion was graced by the presence of Chief Justice Dipak Misra as the chief guest and Union Minister for Law and Justice, Electronics and IT Ravi Shankar Prasad as the guest of honour. The event also saw in attendance Supreme Court Justice Madan B.Lokur, Justice DY Chandrachud, Justice UU Lalit, Justice Kurian Joseph and Justice Ashok Bhushan. 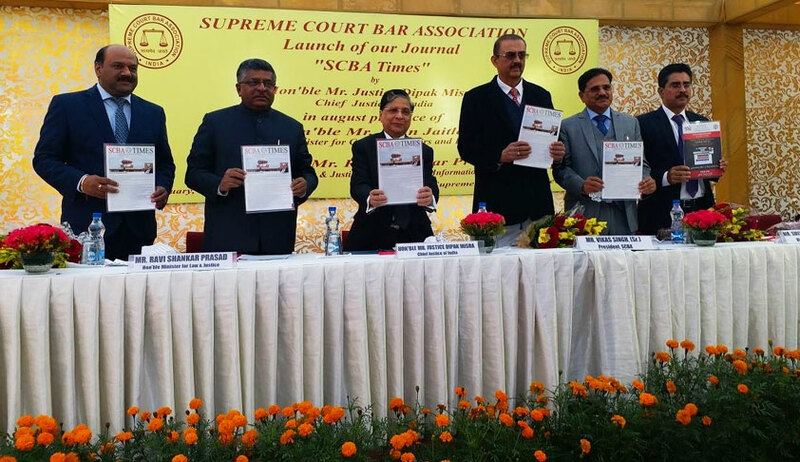 Chief Justice Misra described the SCBA Times as one which is “not an ordinary journal”, but symbolic of “recognition and recollection”. Referring to the ‘obituaries’ in the journal dedicated to judges, advocates and legal scholars, he regarded the same as the source of recollection. The Chief Justice remarked that each issue of the journal shall be awaited by every member of the legal community who will be eager to read its content. The Union Minister also elaborated on how crucial online news platforms are. He stressed on the contributions to the movement for rights and freedom of legal luminaries Fali S Nariman, Soli Sorabjee and the late Anil Diwan and Attorney General KK Venugopal. SCBA president Vikas Singh advanced the assurance that the executive committee of the association shall not influence or interfere in the working of the journal’s editorial board and that the latter shall remain immune from the former.